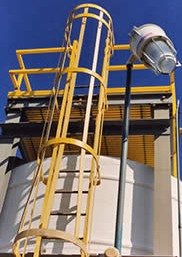 SAFRAIL™ fiberglass ladders and ladder cages mounted on the sides of tanks and buildings are a common sight in a wide range of industries. 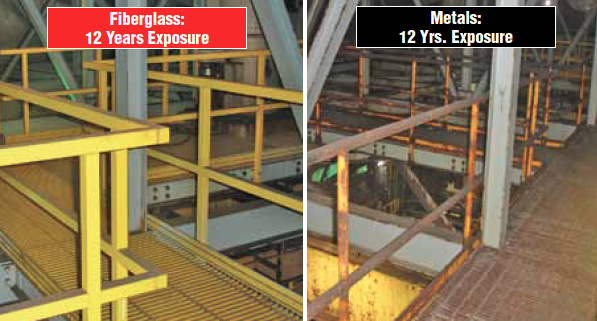 Fiberglass ladder and ladder cage systems have been in use since the 1950’s in chemical plants and other corrosive environments. Even in complete immersion applications, fiberglass has outlasted aluminum and steel and required little or no maintenance. SAFRAIL™ ladders and ladder cage systems are produced using a premium grade polyester resin system with flame retardant and ultraviolet (UV) inhibitor additives. 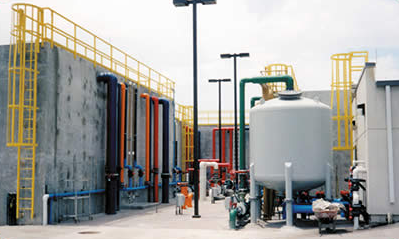 A vinyl ester resin system is available upon request for additional corrosion resistance. Standard side rails and cages are pigmented OSHA safety yellow. The rungs are a pultruded fiberglass polyester tube with a fluted, non-skid surface.